The third set of molars to erupt are typically referred to as the “wisdom teeth.” In most cases, they usually erupt in the late teen years; but some of our dental patients see them erupt into their late 20s. Sometimes, wisdom teeth cause painful symptoms or have infections associated with them. 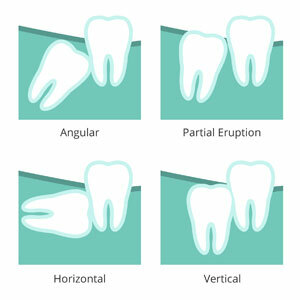 Most people simply do not have jaws that are large enough to accommodate space for these molars to develop properly. Once they begin to erupt, they are often only partially erupted, if not completely impacted. If a flap of tissue covers part of the wisdom tooth, food and bacteria can lodge under the gums and cause infection, pain and swelling. To prevent disease in neighbouring teeth, it is ideal to have the molars removed before they start to erupt or cause problems. At Vision Dental, we have an in-house surgeon who provides wisdom tooth extraction right here at our Menai clinic. To keep you comfortable, sedation dentistry is also available. There’s no need to visit a third party specialist or oral surgeon. Are you experiencing off and on pain or swelling in the back of your mouth? Contact Vision Dental to schedule an exam and X-ray with Dentist Dr Stephen Suster to find out if you need to have your wisdom teeth removed. We’re open late and offer 0% interest free financing.